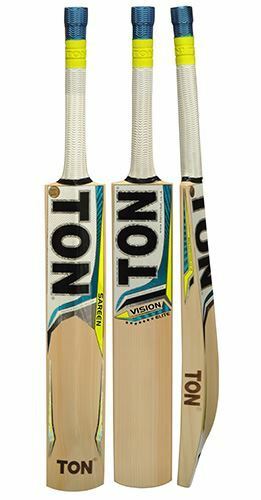 TON Vision Elite Limited Edition Bat: GRADE – Limited Edition English Willow, air dried quality handcrafted by master bat maker. PROFILE – Mid profile with full spine and minimal concaving for maximum wood in the power hitting area. Huge thickness of edges. Slight bow to allow power and control in all shots. HANDLE – Oval shaped handles, premium saravak cane. WEIGHT RANGE – 2Ilb 7oz – 2Ilb – 13oz. GRADE – Limited Edition English Willow, air dried quality handcrafted by master bat maker. PROFILE – Mid profile with full spine and minimal concaving for maximum wood in the power hitting area. Huge thickness of edges. Slight bow to allow power and control in all shots. HANDLE – Oval shaped handles, premium saravak cane. WEIGHT RANGE – 2Ilb 7oz – 2Ilb – 13oz.